If you’re anything like me, busyness is an unforgiving and deceptive filter. It often feels like such a struggle to navigate the whirlwind of everyday life. Too often, busyness becomes our default guide when trying to discern what needs to be done to make a difference. Making a difference is an incredibly admirable goal, but it also can leave us feeling exhausted, incomplete, and confused. What if we reexamined and reprioritized our lives through a different lens that didn’t depend only on accomplishment? If being, rather than doing, was also valued . . . Whom we spend our time with would matter most. We get so enamored with the names of companies we have worked for, or the places we go to school, or where we’re from, that it’s easy to overlook the impact of the very people with whom we interact on a daily basis. Acknowledging the individuals who shape our everyday realities is often neglected because we’re told, in a variety of ways, people are irrelevant to our goals: “No one values my interactions with colleagues because they have nothing to do with my quarterly evaluation.” “No one cares about whom I care for and about. They just want to know if I get my work done.” But show me who you devote your physical presence, time, energy, and thoughts to, and I can show you the forces that shape you. The contours of our lives are not simply shaped by abstract goals, they are determined by the relationships we make and sustain in our everyday lives. We emerge everyday, not out of nothingness, but from the layers of care and attention of those that surround us. Presence would be the ultimate act of accomplishment. When we only talk about what we are doing to make a difference, we also set ourselves up to be perpetually disappointed . . . just wait, I’ll be valuable and noticed once the project is done . . . until my work of creation is completed . . . when the person I care for is better . . . once I finish my education. If we truly valued presence as a type of accomplishment, we wouldn’t delude ourselves into thinking that satisfaction will only come to us sometime in the future. Our presence with others is both process and product, complete unto itself and, at the same time, always shaping our futures. If presence was truly valued as sufficient and meaningful unto itself, we would drastically change the questions we ask one another at the end of a day. Instead of trying to assess the quality and value of our days by asking, “What did you do today?” we should be asking a much more profound question: “Who did you devote your time and attention to today?” Then, and only then, will we begin to understand that the meaning of our experiences can’t be separated from whom we spend our time with, around, and in response to. Deep connection with family, friends, and those nearest to us would be admired more than being adored by strangers. Fame has been confused with importance so much so that we sometimes mistakenly believe that public acknowledgment is synonymous with value. This delusion denies the importance of the deep but often overlooked connections we make with family members, neighbors, and colleagues. Our everyday interactions are always meaningful, even though we rarely acknowledge their impact. Fame compels us to believe that making a difference happens out there, beyond us, in a community far, far away. Fame is the intoxication of making a difference in the lives of those who do not know us. On the other hand, being a difference means cultivating deep connections with those who know us best. We live in an ongoing ecosystem of interactions that is continuously affected by our presence and care and attention. In time of others’ needs, it’s not only about what we do for others. 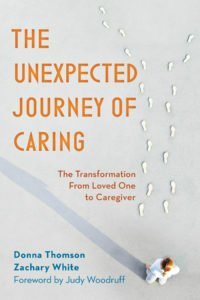 Deep care is also about a willingness to be close enough to listen to those we care about. Too often, we forget that our presence alone is sometimes the only response needed. Yes, that’s right, our presence and attention can be a profound response to life’s greatest questions and needs. Being a difference doesn’t only mean changing people’s lives, it means enhancing the quality of people’s lives, including our own. It requires us to appreciate and respond to the people we move by and around and with in the course of our daily lives. Everyday life doesn’t call us to be brilliant or unique or engage in incredible feats of heroism. Life, however, does require us to believe that our attention and presence and care always make an impact. Always.